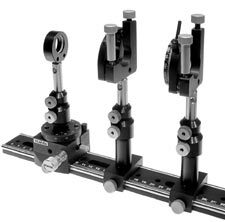 Adjustable Polarizer Holders 5APH59T-1 complement our range of polarizers with an integrated adjustment of tilt and tip about two orthogonal axes. This is a hybrid between a Series T mount and a 1" polarizer holder. The holder accepts optics 25.4 mm in diameter. Optics is stopped by a rest-flange inside the central aperture of the platform, and is secured by a threaded retaining ring. The polarized position is indicated on one 360° angular scale with gradation of 2°. The platform has a removable rod by which you rotate it continuously the whole 360° without obscuring the aperture. You can place the rod into any of the 4 holes on the perimeter. Angular adjustment range of tilt/tip is ±2.5°. Side control of tilt and tip is done by two stainless steel fine adjustment screws with pitch of 0.25mm. The screws push rolling balls against hardened seats, ensuring smooth operation and sensitivity of 3arcsec. Large knobs of the screws ease the strain on your fingers that this stabilized system might cause. Both screws protrude from the top. This control from a side allows easy access, and dense placement of surrounding instruments. For tilting, the platform is preloaded against the base with L-shaped flat spring of our original design that renders the great stability and eliminates induced polarization. Three M4 tapped holes on the sides of the base and on its back allow a variety of mounting configurations, e.g. horizontal and vertical. The holder easily mounts on posts and bases. The holder is made of black anodized aluminium. L-shaped spring is made of high quality stainless spring steel. This mount is also compatible with Ø25.0 mm optics.